The Solomon Sea is a sea in the Pacific Ocean. 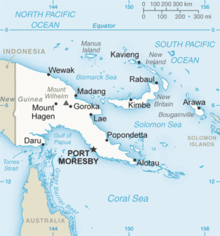 It is between Papua New Guinea and the Solomon Islands. Many major battles were fought there during World War II. The Solomon Sea includes the New Britain Trench. It reaches its maximum depth at 29,988 feet (9,140 m) below sea level. ↑ "Solomon Sea". Encyclopaedia Britannica. Retrieved 10 March 2012. This page was last changed on 19 January 2017, at 15:58.